When you will get paid is one of the most important things to know when you’re about to start a new job. It’s also important to know when you’ll collect your last paycheck if you move on. Will you have to wait for it, or will you get paid upon termination of employment? When Do You Get Paid After Starting a Job? When can you expect to get paid after starting a new job? Will you get paid right away or is there a lag time? Most employers pay their employees on a weekly or biweekly (every other week) basis. Some employers pay monthly; other employers pay on set dates, for example, on the 1st and 15th of every month. When you receive your first paycheck depends on the timing of the company's payroll and when you start employment. Payroll checks may be issued at the end of each pay period worked, or there may be a lag and your paycheck may be issued a week or two (or longer) after you begin work. At the latest, you should be paid by the company's regular pay date for the first pay period that you worked. If you’re not advised about pay day during orientation or when you complete your new employee paperwork, check with your manager or the human resources (HR) department to get the details. What Determines Your Paycheck Amount? The amount you receive in your first paycheck depends on deductions for federal, state and local taxes. There may also be deductions for your share of employee benefits payments. Your employer will ask you to complete a W-4 form so that the company will know how much tax to deduct from your check. Your paystub will include details on your gross and net pay, showing any money being deducted for benefits or taxes. You can use a paycheck calculator to get an estimate of the amounts that will be withheld from your pay. How Will You Receive Your Check? You may find that you are not actually receiving a physical paper check. Many companies choose to pay employers through direct deposit, having their bank place the money in your bank account. If your employer pays with direct deposit, you will have to fill out a form - or, in some cases, have your bank provide you with a voided check - to share your bank account information with your employer. Direct deposit is convenient for both employers and employees: There is no chance of the check being lost in the mail when it's transferred directly into a bank account. If your employer does not have direct deposit available, then you will be paid with a paper check. This may be mailed to the home address you provided or delivered to you at work, or you may have to pick up a check from a set location at work. However you receive your pay, the method of delivery should be clear and transparent. Typically, employers will share information on the payment process on your first day of employment, during new job orientation. 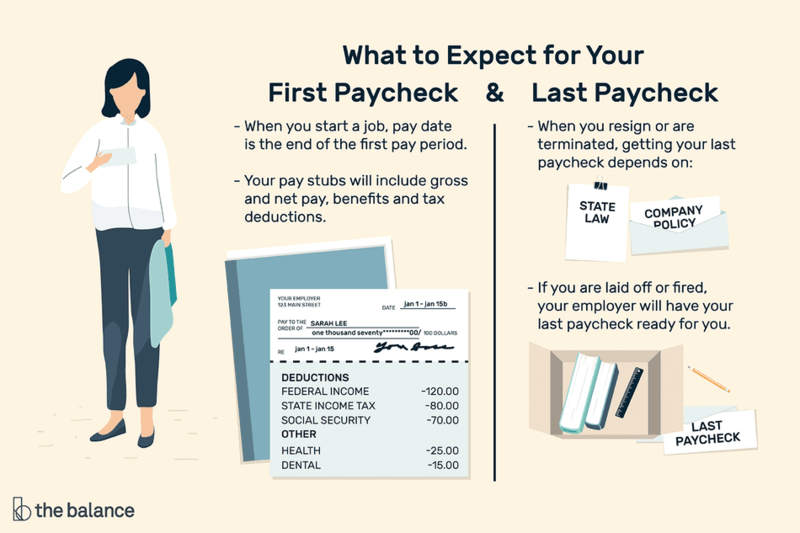 The amount you receive in your first paycheck depends on deductions for federal, state and local taxes, and for your share of employee benefits. Your employer will ask you to complete a W-4 form so the company will know how much tax to deduct from your check. Here's how to calculate how much you can expect your net pay to be. When you get paid, you will receive a paper, electronic or online pay stub which will itemize your gross pay, deductions and net pay. Here's a list of what is included on a pay stub. When Will You Get Your Last Paycheck? When you resign or are terminated from a job, one of the first questions you may have is, "When will I get my final paycheck?" The answer is that it depends. When you receive your final paycheck depends on state law and on company policy. There is no federal law requiring employers to pay you on the last day worked. However, some states may require that you be paid right away or within a certain time period after employment ends. If you are laid off or fired from your job, in many cases your employer will have your final paycheck ready for you at the time you're fired. However, that isn't guaranteed. When you get your final paycheck depends on state law and on company policy. There is no federal law requiring employers to pay you on the last day worked, but some states may require that you be paid immediately. Some employers may opt to pay you immediately, especially if you have been fired, regardless of the law in your state. At the very latest, you should receive your last check on the regular pay date for the last pay period that you worked for the company. Check with the HR department at your company. They should be able to advise you on when you will be paid and what will be included in the check. If you have unused personal time off (PTO) or vacation or sick leave, that will typically be included in your final check.